Venetian is located in the perfect place to start your canal holiday. We are on the Middlewich arm of the Shropshire Union canal and as such the choice of canal journey is both wide and varied. Direct from the Venetian Marina you can access the Shropshire Union, the Trent, and Mersey and the Llangollen and Montgomery canals where you can cross the breathtaking Chirk Aqueduct and then shortly afterwards, the spectacular Pontcysyllte Aqueduct which is a full 120ft above the valley floor of the River Dee. You can ride the amazing Anderton boat lift down the full 60ft to the River Weaver or you could visit the majestic industrial and commercial heart of Manchester whilst cruising the Cheshire Ring, all easily accessible in a week from Venetian. There is the tranquil Cauldon Canal, the potteries and on to the Four Counties ring if you head South down the Trent and Mersey or the historic city centre of Chester if you wish to go north for a long weekend. The Llangollen Canal is unequivocally the most beautiful and spectacular canal on the whole of the British waterways system. The canal begins at its junction with the Shropshire Union canal, just to the north of Nantwich in Cheshire and ends in a trout-filled gully near to the Horseshoe falls, west of Llangollen. It was originally built by Thomas Telford to carry water from the River Dee to feed the Ellesmere canal to Shrewsbury. It was never completed but was eventually changed to feed the Hurleston reservoir, north of Nantwich in 1846. The route begins in benign rolling Cheshire grazing lands, crosses the Welsh marches where you will cruise through the Prees Heath nature reserve and then you encounter the hardest canal topography in the UK. You leave England by crossing the beautiful Chirk Aqueduct and then negotiate the Chirk Tunnel as you enter into Wales. The last pub in England, The Bridge Inn, offers a wonderful view for your lunchtime break. Chirk, is followed, just a few hours later, by the most amazing views of the River Dee. The solution to its 125 ft deep valley, is the most spectacular iron built aqueduct of its day, the famous Pontcysyllte Aqueduct. The cast iron trough which holds the canal water is 11ft wide, 5ft 3ins deep and 1,007ft long at its highest point. There are 19 arches, each with a 45ft span and piers 116ft high. To keep the aqueduct as light as possible, the slender masonry piers are partly hollow and taper at their summit. The mortar was made of oxen blood, lime and water. The aqueduct holds 1.5 million litres of water and takes two hours to drain. And for the non-Welsh speaker, Pontcysyllte is pronounced ‘pont-ker-suth-tee’ – – you may need to practice the famous Welsh ‘ll’ sound! Throughout its route, the canal passes through quintessentially English and Welsh villages dating back almost 1000 years. Whitchurch and Ellesmere are popular stopping off points, as is the Welsh border town of Chirk with its historic castle. Llangollen boasts some of the finest visitor moorings on the network with electrical plug-in and water supplies to each mooring. CRT charges a small fee (currently £6) for 48 hours. About half along the Llangollen canal, the Montgomery canal heads off south for over thirty miles towards Newtown. The canal route is almost entirely bordered by rolling green countryside with the exception of the main town on its route being Welshpool. This canal was unused for many years and is now an excellent venue for fishermen. The canal is alive with rare aquatic plants, and otters and water voles have also been spotted. Several nature reserves border the canal, filled with wildflowers and insects, including dragonflies and damsel flies. Either the whole route to Llangollen or the Montgomery canal can be cruised in one week from Venetian, but not both. To reach Llangollen we recommend cruising for eight hours per day on the first three days in order to reach Llangollen on the fourth day. Because the flow of the canal is approximately one mile per hour against you on the outward journey, the return trip takes a day less. Cruising the Montgomery canal will be a little more relaxed as the distance covered will be less. An extra week will enable you to cover both canals with relaxed ease. A two-night stop in Llangollen will then enable you to enjoy the fabulous Llangollen steam railway, some of the walks around the area and certainly up to the Horseshoe Falls, and also relax at some of the wonderful canal side pubs. The Jack Mytton, at Hindford, Oswestry, a few miles past the Montgomery canal junction, is most highly recommended. Venetian Marina sits on the Four Counties Ring, on the Middlewich branch of the Trent and Mersey. This means that straight from the Marina you are on the circular route whichever direction you chose to go in. The ring is 109 miles around with a total of 94 locks. We always recommend to our customers that they head East first as they head up at the start of the trip and complete the downhill part of the trip towards the end of their holiday. The ring navigates through the Counties of Cheshire, Staffordshire, Shropshire and the West Midlands. Going East, your route winds its way across the rolling Cheshire countryside to Middlewich where it joins the Trent and Mersey mainline. You can then follow the canal south through farmland and meadows until the climb up to Kidsgrove, under the Macclesfield canal before it joins at Harding’s Wood, and just prior to negotiating the famous, mile long, Harecastle tunnel. (Built 1827 and still in use) The tunnel is manned by the Canal and River Trust and instructions for passage are contained in your cruising guides. Stoke on Trent follows shortly after where a good stopping off point might be Festival Park where you might fancy a trip to the Cinema of a relaxing night at the canal side eating pub. It is just past here that those heading for the Consall Forge on the Cauldon Canal will leave the Trent and Mersey at the Etruria museum. The Four Counties Ring continues now heads downhill through the potteries towards Stone and the Junction at Great Hayward where the ring turns right on to the Staffs and Worcester. It is worth stopping here for a visit to Shugborough Hall, the home of Lord Litchfield. It is here that every boater should have a bit of fun. The “Tixall Wide” are just perfect for driving around in a huge circle before heading off towards Stafford and Penkridge. The ring is heading back uphill here towards Autherley Junction where the route joins Shropshire union for the Thomas Telford route back up the Nantwich. The “Shroppie” boasts some of the most amazing canal views of all with fabulous deep cuttings, aqueducts and ancient market towns. 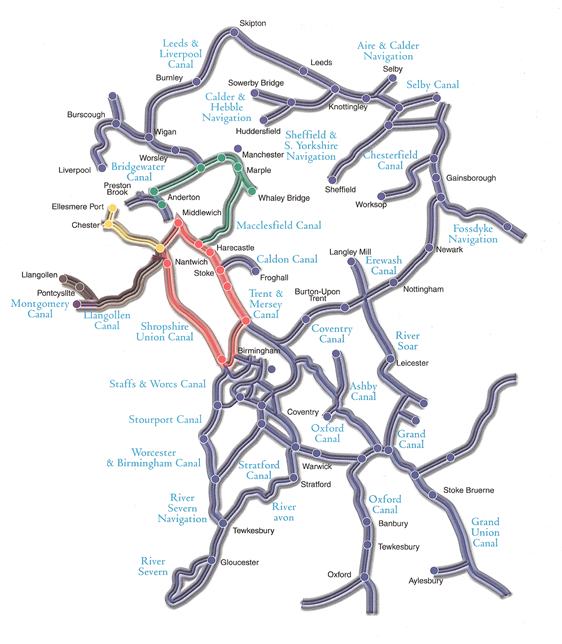 This route takes one week of reasonably persistent cruising but can be eased into two weeks if the Cauldon canal is included. The Caldon is one of the best-kept secrets on the system. It starts in the heart of the industrial metropolis of Stoke-on-Trent at the Etruria Museum junction. It is the home of Jesse Shirley’s Etruscan Bone and Flint Mill with the last working steam-powered potter’s mill in Britain. It was built in 1857 to grind bone and flint for the pottery industry. Today, it is a thriving museum offering lots of things for all interests and most definitely worth spending an afternoon at. The junction is that start of one of the most scenic and attractive canal routes in Britain although the first few miles hide this fact. It runs for 18 miles from Stoke to Froghall with an alternative route to Leek. Starting from the junction the canal climbs up through industry flanked locks to Bucknall and then Stockton Brook and bursts out into beautiful countryside past Endon. You are then travelling through spectacular moorland as this route follows the Churnet Valley steam railway and interchanges with the river prior to finally parting company with the river at Consall Forge. This is one of the most beautiful places to spend the night on our canals. The pub is pretty good too!!! The Cheshire Ring requires more effort than some of the other routes but has its own rewards. This is a circular route of 97 miles with 92 locks but added to the extra mileage between Middlewich and Venetian, it is closer to 107 miles and 96 locks. This route is a mix of quiet country scenery, industrial history and vibrant city buzz. The Cheshire Ring runs takes the Macclesfield Canal and takes in parts of the Trent and Mersey, Bridgewater, Rochdale, Ashton and Peak Forest Canals. This route can be done in one week, but you may want to consider a two week holiday for a slower pace and to visit some attractions. It navigates through the heart of Manchester for amazing shops at the Arndale Centre, exciting nightlife along Canal Street, fabulous food in China Town and of course, it is the home of Manchester United. Other features of this route are the impressive Anderton Boat Lift, Preston Book tunnel, Croxton aqueduct, views of Mow Cop and the challenging and impressive Marple flight of locks. Heading west from the marina and then turning north up the Shropshire Union. Chester is a full hard days cruising away or if you take your time, and maybe overnight at the Shady Oak pub, a relaxing cruise to arrive for lunch the following day. A night or two in the historic city, with its Roman walls and medieval centre, followed by a lock-free cruise, from Telford’s converted warehouse in Chester basin to the National Waterways Museum at Ellesmere. This could be a fabulous midweek short break or relaxing weeks’ holiday.